Convert geometry between FormIt and Revit. Learn how it works and get the latest Add-In below. Download and install the Revit Add-In for your version of Revit above. Specify a folder of RFA files which will be converted to FormIt files, output to a folder of your choice. Specify a folder of SketchUp files which will be converted to FormIt files, output to a folder of your choice. Note that FormIt for Windows can open SketchUp files natively, which allows you to preview and repair the files before saving and later converting to Revit. Specify a FormIt file to import into the current Revit project. 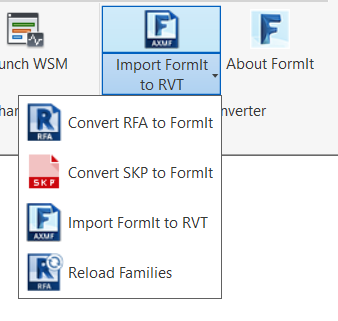 If you placed RFA content in a FormIt file that has been converted to Revit, you can replace FormIt's RFA approximation with the true RFA files by pointing to the folder where the RFA files exist. FormIt Groups become Revit Mass Families by default, which support Wall by Face, Curtain System by Face, and Roof by Face. FormIt Levels become Revit Levels and support Floor by Face, and Floor Plan view creation. FormIt materials become Revit materials when using Revit 2018 and later. 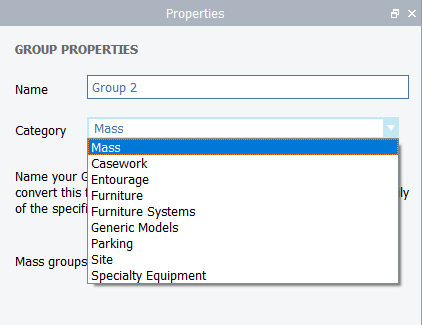 Groups in FormIt become Revit Families, and can be set to a variety of non-hosted Revit Family Categories. Two commonly-used categories when working with FormIt + Revit, but have unique characteristics. Generic Models can be recategorized and nested in other Family categories, but Masses cannot. FormIt Groups can also be imported into the Revit Family editor to create RFA of any family category with materials. Revit Families can be exported to FormIt, and then later converted back to the original Revit Family. The Import FormIt to Revit command adds FormIt models into an existing Revit project, so you can update often. The FormIt origin point and the Revit base point are used for reliable placement of imported FormIt objects. The Group Name in FormIt is remembered upon Revit Import for use with Revit Filters. Revit System Families can be exported to FormIt using SAT export options. SketchUp files often have geometry fidelity issues that will cause issues when converting to Revit. Using FormIt for Windows, you can open or import SketchUp files and then use built-in diagnostics and repair tools to fix SketchUp geometry so it's solid and ready for Revit. Save the FormIt file and use the Revit Add-In feature "Convert FormIt to RVT" to conver the geometry into your current Revit project.